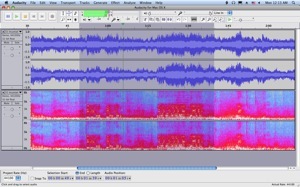 Audacity is a free multi-featured multi-track sound editor and DAW for MacOS, Windows, and Linux. It can record directly or import WAV, Ogg Vorbis, MP3, AIFF, and many other formats. Features include builtin effects, VST plugin loading, fast editing, and unlimited undo. Record from microphone, mixers, cassettes, records, minidiscs, FM radio… Scheduled recording feature. Import sound files, edit them and mix with other files or new recordings. Export to several common file formats including WAV, AIFF, FLAC, MP3 (with optional LAME library), AAC (import only). Fast sample-level editing with Cut, Copy, Paste and Delete, and unlimited Undo/Redo. 32 bit float internal storage and high quality resampling and dithering. Smooth volume envelope. Bugfix for MP2 files import. Bugfix for the excessive delay that occurs when typing into labels in long projects. Normalize now preserves left-right balance in stereo tracks by default with an option to normalize stereo channels independently. Posted by Nancy on Mon, 03/05/2012 - 02:07. I am having real difficulty with recording drop-outs. I am only recording a single voice track and the drop-outs are unpredictable. You can see the wave files sometimes and not hear the record on playback - usually just for a couple of seconds. Sometimes it isn't there on one playback and then it comes back on the second time around. Recording that normally takes me a couple of hours took several hours because of this drop-out problem. I would love it if someone knew why Audacity is doing this....it didn't when I first started using it. Posted by Morab on Fri, 01/06/2012 - 10:53. I've tried downloading drums applications but can't seem to get them to work on Audacity. I can do vocal tracks just fine, but no percussion. Are there any percussion add-ons that will work on Audacity which I can download? I'm new at this and its driving me crazy not having some sort of beat to stick to. Posted by David on Thu, 10/15/2009 - 01:06. I am using Audacity Beta 1.3 unicode on XP and I am having problems with the program starting and stopping when I get about 6 tracks or I have a long recording. It will often leave out areas of the recording while starting and stopping. Can anyone help explain to me what is going on? Posted by Laura on Wed, 06/17/2009 - 23:01. I edit the audio file but it won't save with sections that are edited. It will return back to the way it was originally. Does anyone know how I can save the edited file? I have Audacity Beta because it has the play-at-speed control. How to save edited songs? Posted by MJ on Sun, 03/08/2009 - 19:30. After i edit a song and click file to save it and put it on a cd, "Export Wav" it isn't there. The only export options are export selection and export multiple. What's wrong? Use this one, its FREE! Posted by ywae84 on Thu, 02/19/2009 - 04:32. The effects are difficult to learn, but not impossible if your patient and smart. Take your time to learn some things. If you want to record your own music for free. This does fine. I've been using the Stable version, for a few months now. Posted by Anonymous on Fri, 06/25/2010 - 14:48. Try both - they are free after all. Posted by Anonymous on Wed, 02/25/2009 - 22:20. How do I record multiple tracks? Posted by Anonymous on Mon, 03/23/2009 - 02:28. How do you split tracks when recording from a LP? Posted by Anonymous on Tue, 12/30/2008 - 07:43. I get blank tracks! Nothing is recording. Any ideas? Posted by Anonymous on Mon, 08/11/2008 - 15:07. I saw someone mentioned they had a problem opening the program even though it is shown as open in task manager. I had this problem and finally figured out to go to "Properties" of the program and change "Run" to "Maximized" if it currently says "None." Hope this helps. Posted by Bob on Sat, 08/02/2008 - 15:14. I'm sure its my PC but I can't figure out why I can't get sound out of this program. All other programs play sound no problem. I've checked the output device and everything seems to match up. Any ideas? Posted by jon on Sat, 01/20/2007 - 14:55. I have an emagic 6/2 usb interface, but Audacity will only let me record two tracks at a time. How can I fix this? Posted by Michael on Sun, 07/23/2006 - 12:12. Hey ppl, my biggest prob at the moment is, Im trying to do a keyboard overdub for someone on their audio backing track and the backing track keeps having little dropouts and its driving me insane...like little bumps. I tried importing the mp3 directly to stereo track one and problem still remains. Posted by Anonymous on Tue, 07/01/2008 - 20:36.
usb mic, win xp on an acer aspir 5600, 1G RAM, every other app and tray program killed ... this didn't ought to be a problem. Posted by Nevyn on Sat, 07/30/2005 - 12:44. Need a link that works for audacity help manual on line. All searches bring me to dead links. Posted by Jim Pilgrim on Fri, 01/20/2006 - 10:18.
: Need a link that works for audacity help manual on line. All searches bring me to dead links. Posted by Anonymous on Sat, 03/07/2009 - 19:07.
sourceforge is were they build it. I think the manual is there. Posted by russell on Tue, 06/14/2005 - 17:36. One track bleeds onto the next while recording, How do i stop it? Re: Help stop me bleeding! Posted by Michael. on Sun, 07/23/2006 - 12:01. Tried line in on track 2 but that does not work, track 1 still bleeds thru!! Posted by ELITE on Sun, 05/10/2009 - 04:27. Posted by Darien Starr on Tue, 04/12/2005 - 04:02. Dude, I've been messing around with all of the free programs for years, it's tough to afford software on an underground budget. When I upgraded to windows xp i was pissed cuz you can't really use Pro Tools Free on it. Then I found Audacity. It does have it's limitations, but you CAN record your demo with this program. 2 thumbs up. Posted by Michael on Sun, 07/23/2006 - 12:04. How do U prevent tracks from bleeding over top of each other? Posted by Anonymous on Tue, 02/03/2009 - 00:35. I have the same problem with CakeWalk 9. I can't figure the problem out. I was in hope of finding help here. Oh well. Posted by David Connolly on Thu, 03/17/2005 - 13:53. Audacity was the answer to my problem of getting an 8.5 hour recording converted from 2 WAV channels into a single stereo MP3. I'd previously used KRISTAL but it refused to open each 2.7GB WAV file. I tried several others too but all failed to handle the file size. No problem with audacity. Not even any sluggish response when all 5.4GB were imported. Excellent product ! Posted by Rudy on Tue, 03/15/2005 - 06:21. I've just noticed recently that when I execute Audacity it stucks at the initialization phase with the hour-glass icon showing forever. I have to kill it with the Task Manager to get rid off it. I don't know when exactly this started happening because I have not used it for a while and in the meantime I updated XP with all the recent SPs. Using the latest version of Audacity results in the same thing. Anybody else experiencing this, too? Posted by Dave Levinson on Mon, 03/21/2005 - 12:51. If you haven't already tried this. Completely uninstall Audacity and then re-install. This may clear up the problem. Posted by Tom on Sun, 01/23/2005 - 14:51. I'm new to computers, so if my problem should be obvious please excuse my ignorance. My problem is that after a minute or more of recording with Audacity my computer completely freezes up. I'm using an HP 8490 with a Pentium 2 and 256 MB Ram on windows 98. Is this insufficient to run the program? Is there anything I can do or another download available that will run more smoothly? Any help would be appreciated. Posted by dude on Sun, 07/24/2005 - 03:42. 6470z. OS is Windows 98. 450MHz processor. Had 96MB RAM, just upgraded to 128MB RAM and problem still occurs. I have been able to record audio a couple minutes long and export as mp3, but most of the time it lasts less than a minute. Sometimes just audacity locks up, somethimes the system locks up. If just audacity locks up, I can close it and re-open it to start over again. Most of the time, recording doesn't last more than a minute. If anyone can tell me what's wrong, I would greatly appreciate it. I'm using it to record music I'm making with friends in a band. It's basically a poor man's studio. I would really like to be able to record live music with free software on this old computer. If anyone knows of other free software that records audio input that will run on windows 98, please tell me where to find it. Posted by Cris on Mon, 11/08/2004 - 17:24. I personally have used Audacity for about 6 months and it works great, it rivals many softwares that you have to pay for and it continually gets better. Posted by Jeff Wheeler on Sat, 11/27/2004 - 03:31.
: I personally have used Audacity for about 6 months and it works great, it rivals many softwares that you have to pay for and it continually gets better. How does it compare to Adobe Audition? Posted by Steve on Wed, 08/20/2003 - 12:09. After recording first track the second and the subsequent tracks recorded comes with delay. Posted by Sam on Thu, 10/23/2003 - 16:21. Posted by Michael on Sun, 07/23/2006 - 12:06.
same problem here. How do you sinc it up? Limited by the processing power of your PC! Posted by Anonymous on Mon, 04/06/2009 - 13:09. .On my newest computer I have gotten results of 25 tracks and more. General rule of thumb is processor speed and amount of ram you have installed. Audacity is an awesome program with so much potential for artists on a limited or no budget to afford the latest and greatest of options on the market. I look forward to all the future updates on this software and see how it progresses in its much more mature stages of productions. Hope that helps anyone who may not have known otherwise. Posted by Paul on Mon, 06/29/2009 - 15:38. Nonsense. Though it is true that memory will definitely limit the number of tracks you can record, it has nothing to do with synchronizing. Something else is going on there. Posted by Abe on Tue, 07/15/2003 - 09:56. Posted by Paul Elias on Wed, 07/24/2002 - 21:29. Great software but no help files. Is this because it's Beta? Posted by Introspecitve Journeys on Thu, 03/21/2002 - 17:43. I spent about half a day trying to connect to the servers to download this lovely little proggie. It was much worth it. This program shares much in common with cooledit, but I think I like the interface (and price!) of this nice program. The VST effect support is a major benefit. My advice: keep trying, and go to the company's web site if you have to. Posted by John on Sat, 06/09/2001 - 16:53. When I tried to unzip the download, I got an error message that "Internet Explorer was unable to link to the Web page you requested. The page might be temporarily unavailable." Download cancelled.